Lakes and ponds are traditionally treated by identifying what is growing on the surface and then applying the appropriate chemistry to slow or stop its growth. Unfortunately, chemical treatments fail to address the root cause of many water quality issues. For the vast majority of lakes and ponds the root cause of the problems on the surface lies in the nutrient rich muck on the bottom. Muck is a combination of organic debris such as dead algae, plants, grass clipping, leaves, or animal waste and inorganic sand, silt and gravel that builds up on the bottom of lakes and ponds. Problematic muck, stores excess nitrogen and phosphorus that is readily available for algae and aquatic plants. In addition, too much muck can reduce water quality and clarity or create a toxic environment for fish or other organisms. Fortunately, muck can be treated and the health of the water body can be restored using several different techniques. The most common treatment for muck is physical removal by dredging. Dredging comes in two basic forms: mechanical and hydraulic. Mechanical dredging involves the use of heavy equipment, an excavator for example, that scrapes the muck off the bottom and discards the material onto a waiting barge or the shoreline. Hydraulic dredging involves suction equipment that takes a slurry of muck and water off the bottom and sends it via pipeline to another location to be discarded. An advantage of dredging is the process removes both the organic and inorganic compounds. 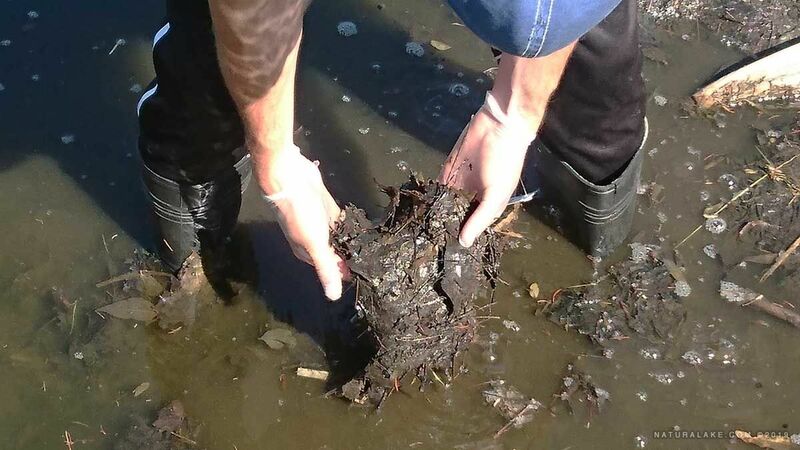 Specifically, the phosphorus and nitrogen found in the muck are physically removed from the aquatic environment. However, dredging can be hazardous in some environments, prohibitively expensive, and can release pockets of phosphorus and nitrogen found in the underlying muck layers into the water column. Many times, because of pumping or hauling costs, the muck is discarded so close to the water body that the matter and nutrients can just drain right back in. A second technique for muck removal in a lake or pond is through adding oxygen to the water. Specialized equipment (bottom diffusers or surface aerators or fountains) can add dissolved oxygen to the water column or the surface of the muck layer to varying degrees. When dissolved oxygen is added to the muck layer it creates a favorable environment for the aerobic bacteria that love to digest the organic compounds. Breaking down organic compounds found in muck aerobically is favored over anaerobic digestion because it does not generate any toxic compounds (methane or sulfur) as a byproduct. Stimulating the natural aerobic bacterial community reduces nitrogen and minimizes the release of phosphorus from the muck layer by creating an aerobic zone at the water sediment interface. Aeration may have limitations due to cost or power capabilities, but it can be an effective option for treating muck and offers the benefits of better circulation and dissolved oxygen too. A third technique for muck removal is using our MD Pellets, a pelletized probiotic that speeds digestion of organic compounds and nutrients. When applied, the probiotic pellets sink into the muck layer and activate. This process infuses muck with beneficial microorganisms, biostimulants, and vitamins for optimal degradation. The bacteria, introduced from the pellets and naturally occurring, produce enzymes that break down complex proteins, starches, and lipids into amino acids, simple sugars and fatty acids which are rapidly used in bacterial metabolism. The muck compacts, solubilizes, and washes out to varying degrees resulting in decreased muck levels, reduced nitrogen and less available phosphorus. Md Pellets are low cost and environmentally friendly option for treating muck with significant organic content. Naturalake Biosciences recommends evaluating each situation to see which muck removal technique is right. If the muck is composed of mostly inorganic compounds (sand, silt, gravel) from runoff it likely that it will need to be dredged. 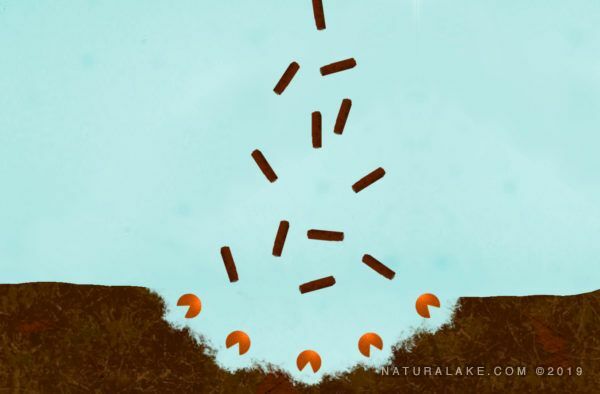 If the muck is composed of organic compounds (dead plants and algae, leaves, etc) then using a pelletized probiotic like MD Pellets to stimulate the muck layer and restore the health of the lake or pond is a great option. Complementing the MD Pellets with aeration always improves the speed of the muck degradation.